XO Laptop Software Release 8.2.0 Review: Sugar Works Now! During the XO Laptop Upgrade Weekend here in Washington DC, I've been taking notes on the OLPC Learning Club DC impressions of One Laptop Per Child's Software Release 8.2.0 for the XO laptop. The overwhelming verdict: Finally, the XO laptop really works! First and foremost, the 8.2.0 upgrade process is easy, especially if you upgrade off a USB memory stick. Gone are the days of dealing with Terminal - its all automatic. That said, there was consensus that its still more fun to upgrade as a group. Yet there are two reasons not to upgrade in haste. You will loose any saved data, so be sure save it to another USB memory stick first. Next, you'll also loose any extra programs, like Skype or Opera, and will need to re-install them again. Can your XO laptop do this? "Wow!" That the overwhelming response from DC. We're amazed at how much easier and faster everything works. From the simple inclusion of a Control Panel, to a fixed XO Chat, to the advanced Neighbourhood View where different types of connections are shown differently, the user interface is much more intuitive. Or as one parent said "I can use the XO now!" The XO now can claim to come with a decent set of Wikipedia content with both internal and external links to more data (photo). By covering the basics, OLPC shows what can be done to help children learn even when they are offline. There are also User Guides and even complete XO manuals to show new users the XO's tricks. Its not all smiles and happiness in One Laptop Per Child land - there are a few bugs showing up in Release 8.2.0 that need fixing. One of the favorite programs for children, and a great teacher of letters and spelling is XO Speak, and now it works only sometimes. It's often silent, especially when you want it to comfort a sleepy child. Also, there are reports that XO Get doesn't work from Sugar and you need to go back to Terminal to add new programs. If you have an XO laptop, its time for you to joint he rest of us and throw an XO Upgrade Party of your very own. No matter if you're in a group or not, you'll never be alone. The entire OLPC News Forum is ready to help you with Sugar and Linux. As you do upgrade, be sure not to be shy. We all want to know your XO Upgrade impressions! I agree. "Now the XO works!" is a pretty good summary of my first impressions after upgrading. 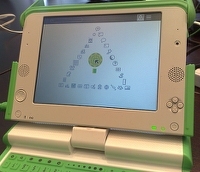 I upgraded via the Internet using olpc-update and let the Control Panel>Software Update feature install new versions of my existing activities. I then added the URL for the G1G1 activity collection and went through the update process again, but declined the content collections in order to maximize free "disk" space. The whole process took about two hours, including restoring my customizations to various things and re-installing PySol. I loved the new Control Panel's frame and timezone applets! I prefer the "Extreme Power Management" setting in the "Power" applet to the "Radio On/Off" setting in the "Network" applet for use in an airplane; "Radio Off" gets reset to "Radio On" if you re-boot (which you would have to do if you have to swap batteries), whereas "EPM" keeps the wifi off until you un-check the option. I like being able to delete a Journal entry from the list view. And I love being able to pick and choose which activities are quick-access (but I'd also like to be able to re-order them to my own taste). I've not had a lot of time to check out other features or to play much with any of the activities (except to assure myself that my StarChart v5 activity functions as designed with the new build). But I expect to spend a lot of time with my machine over the next couple of weeks. "its time for you to joint he rest of us and throw an XO Upgrade Party of your very own"
Funny you should say that, because I am in the midst of organising one for Ottawa. Woohoo! And as you do, be sure to make a cheer for the Sugar developers that made the Release so cool. I've been testing the joyride builds and candidate releases for 8.2 the past few months. Today I backtracked to release update.1-703, for some comparative testing. It sure seems slow and awkward. I'm going back to the future (8.2-767) real quick! Nice trick, the pyramid view. Would have been nicer if someone documented the hack for the rest of us though. Check out http://en.flossmanuals.net/Sugar/ModifyingSugar for the instructions and some even more cooler views. xo-get hasn't worked to install activities in its GUI since the security system which isolates activities from each other was added. Browse works well to install activities from the wiki though. 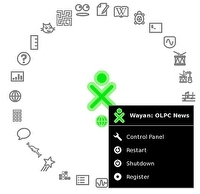 Please submit more information on the Speak problems, preferably in the OLPC bug tracker, as that can still be fixed in an update which would be available via the control panel. In addition to installing activities from Browse, you can install new activities through the Control Panel. If you install them all, it will take a good while, and you'll end up with ~100 activities (a good portion of which don't work in 8.2). Choose wisely! This is the version XO should have shipped with one year ago. It's not perfect but it's definitely in the usable range. Sugar on a bootable USB. Could hardly be simpler. i like a laptop i dont have a laptop what can i hive me the lap top. What information do you have for instructional designers who wish to develope educational courseware and media for the XO laptop system.